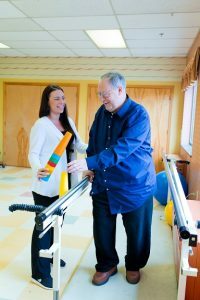 Bridgewater Center for Rehabilitation and Nursing is a long and short term care facility providing services to the disabled and elderly for five decades,offering a complete range of medical, nursing, and rehabilitation services. Please come and take a tour of our facility and meet the outstanding people who will care for you or your loved one during your stay. All our employees are treated with dignity, respect, and recognition of their personal aspirations and values. Bridgewater welcomes all older adults who need assistance with the tasks of daily living. Providing the area's best Rehabilitation! Every family eventually faces the difficult decision of what to do when a loved one is no longer able to live alone because they need personal care and attention that no one is in a position to provide. We accept private-pay and participate in all third-party payment programs including Medicare and Medicaid, and participate with major managed care organizations and HMO’s. Arrangements can always be made with any HMO at your request, subject to the HMO eligibility requirements.